The BEST thing was seeing his cameo in Val Wilder - with the same hair - I almost peed myself. Yeah we could do with them in London right now. I always thought Ponch was the cutest. I just watched the start (close ups of him) and didn't care for the show. Have you seen the episode of 30 Rock with the blonde officer from Chips? its pretty darn funny! I barely remember seeing this show (I thin I was watching Mork & Mindy re-runs), but I know it was a favorite or many! My favorite part was the freeze-frame, all smiles endings. So cheesey. 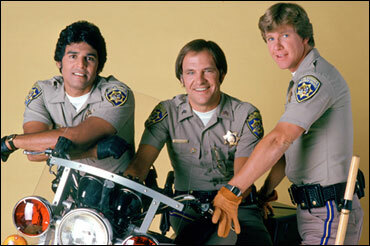 I saw reruns in the 80s and totally had a crush on Erik Estrada. Its too bad Erik Estrada turned into such a dufus. He was cool as can be back in the day. My co-workers and I took 20 minutes trying to figure out Ponch's partner's name last Monday. We were in the middle of a meeting, so no one wanted to break out IMDB on their smartphone. After the meeting was over, I'd forgotten about looking for the guy's character until I stumbled across your blog via Toadally Talking. Thanks! I totally had a thing for Ponch. Can't believe I was only 7 when the show ended, I must have watch reruns for years (of course, back then I always had a thing for much older guys, rarely like guys in my own age range, even in the real world). Still think Erik Estrada was hot in that uniform.